Franz Ferdinand traveled in style. One of Franz Joseph’s objections to extensive traveling of his archdukes was the expense. 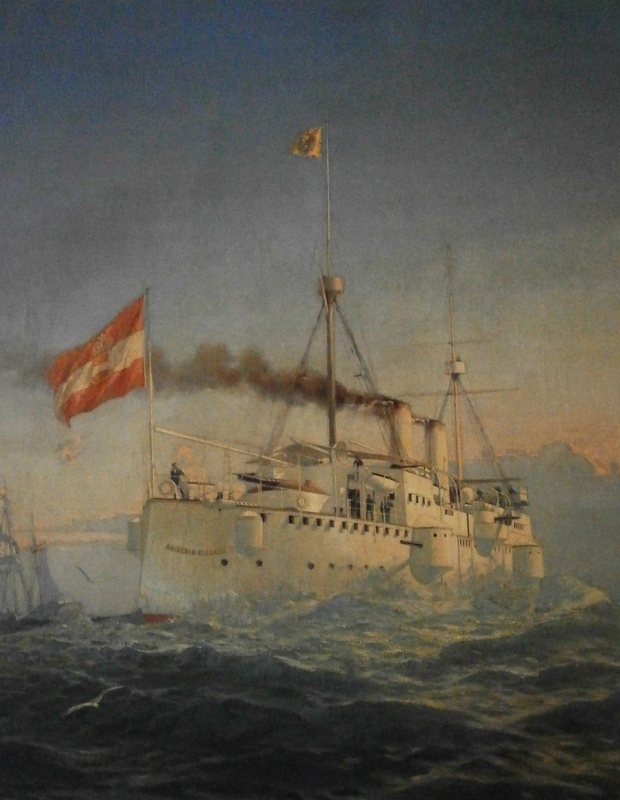 From Trieste to Japan, Franz Ferdinand took one of Austria’s then most modern ships, the Kaiser Franz Joseph I-class protected cruiser, originally called a torpedo ram cruiser (Torpedo-Rammkreuzer), SMS Kaiserin Elisabeth. In construction since 1888 and launched on 25 September 1890, she was commissioned into service on 24 January 1892. 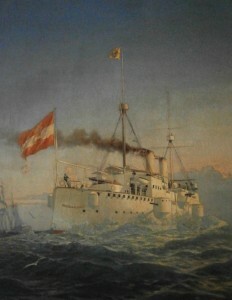 Thus, her voyage to Japan was her first long range trip and test of both ship and crew. The ship did not outlive 1914 either. It was scuttled near Qingdao in China on 2 November 1914, having been the target of the world’s first sea-based airborne attack on 6 September 1914. Kaiserin Elisabeth was a steel-hulled vessel of 4064 tons displacement of 104m length and a 15m beam. She achieved a speed of 19 knots (9000 horsepower). The crew comprised 450 officers and men (21 civilians such as cooks, stewards and servants; 386 crew and NCOs). Commander: k. u. k. Linienschiffs-Capitän Alois Ritter von Becker.